That personal investment has provided a boost in Cheyanne’s academic performance and confidence. 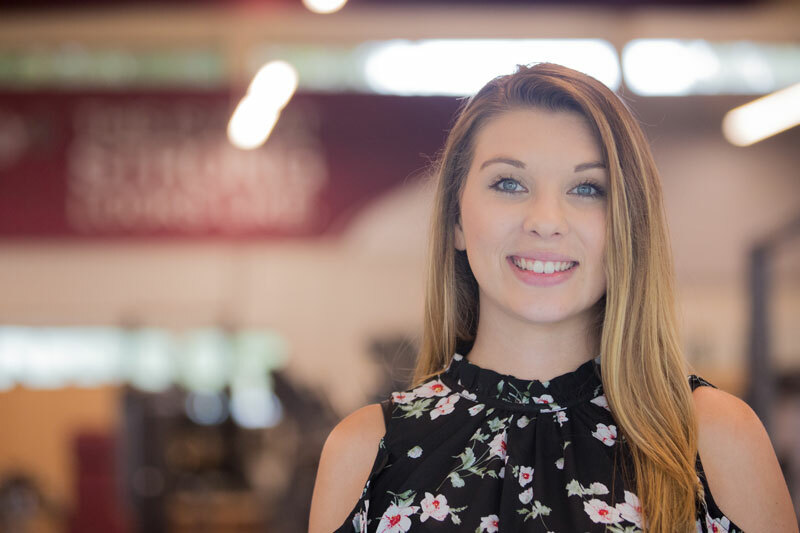 As an exercise and sports science major with a concentration in health and wellness, Cheyanne takes a personal interest in helping people achieve their fitness goals. She is an employee in the Lowery Fitness Center on campus and serves as a group exercise instructor for the Working on Wellness (WOW!) at Work and Angels in Motion (AIM) programs for employees and students. This summer, Cheyanne completed an internship at Rex Wellness Center where she was able to observe fitness assessments and personal training sessions, teach and set up group fitness classes, and provide fitness equipment orientations. She also got to practice some of the skills that she has learned in the classroom when it comes to fitness assessments, such as blood pressure, skin folds, and strength tests. After graduation, Cheyanne plans to work in cardiac rehabilitation, an area of exercise science that she finds to be very rewarding and challenging at the same time. She would also like to continue teaching group exercise classes and conducting personal training. Cheyanne feels that Meredith has prepared her to reach her career goals through resume building, portfolio preparation, and providing opportunities to apply her knowledge in real-life situations. Her professors also helped her find a path based on her interests and strengths.